The Bement School provides an education based on time-honored school traditions and values for 240 children in kindergarten through ninth grade, day and boarding. Located in historic Deerfield, Massachusetts, the open campus is comprised of twelve buildings in a beautiful rural setting. From the classrooms to the dorms, students and faculty live and learn as a family, while encouraging responsibility for their own work and actions. Bement actively seeks an academically diverse, international, and multi-cultural student body. Students and adults at Bement work together to create a climate of acceptance, kindness and challenge which nurtures each child intellectually, creatively, physically, and emotionally. In the summer of 2014, a seldom-used media room adjacent to the school library was converted to a maker space. The physical space was already equipped with clustered trapezoid table seating, and an interactive white board and projector. A traditional white board ran along the back wall. The first step in the transformation was painting one wall to become a green screen. This instantly changed the look of the room, and made it feel different. An unused book case was brought in for storage. While not a large space, the room is flooded with natural light and has enabled us to offer a designated maker space for students. We did a soft launch of the maker space in September of 2014. Our philosophy of the maker space is to create an area for creativity and exploration utilizing science, technology, engineering, art and technology. It is an additional resource, under the direction of the librarian, and maintains a flexible schedule. It is available to the entire school population. The 7th grade science class met in the space during the fall term and did an exploration of all the available resources, learning how to use them and incorporating the science principles they were learning. Students in our lower school, grades K-5 were introduced to the space during their weekly library time. Children in the afterschool program began using the space as a creative building and engineering lab. In conjunction with our all-school study of space in December of 2014 the maker space was used frequently; to film green screen space scenes, design and build rockets and imagine aliens. A student-led elective of upper school students learned LEGO Mindstorm robotics. In a short time, interest and use of the maker space has grown. 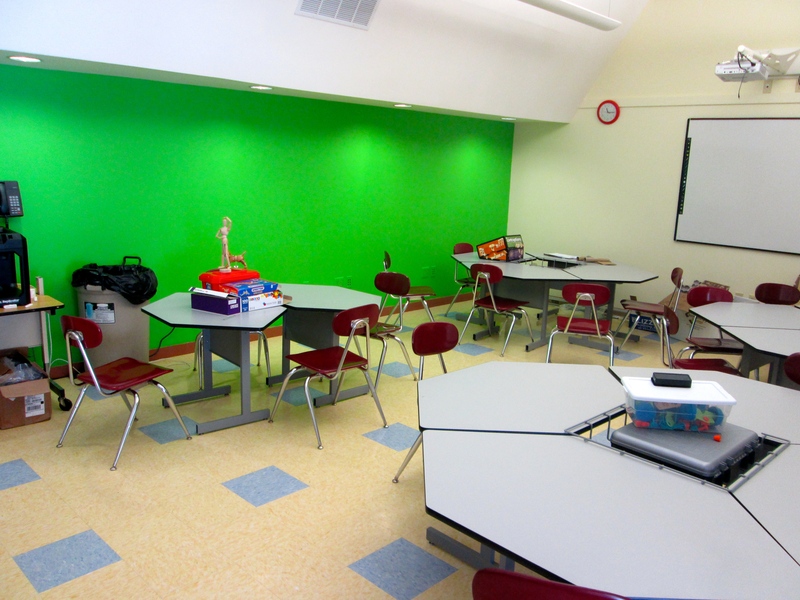 The two centerpieces of the room, the green screen and the 3D printer have seen frequent use. Kindergarten students use the maker space weekly and have built their own vibrobots, first grade students used the green screen to showcase their alien stories, fourth grade flew among the planets in virtual space in NASA space suits. Fifth grade students designed and constructed rockets from cardboard and other recycled materials. Science students in grades six and nine have each completed projects utilizing the 3-D printer. Using Sketch-up software, students designed holders for a classroom egg drop competition. After-school students have mastered origami, and built amazingly complex LEGO structures. The Bement maker space was created entirely through donations and grants. By utilizing an under-used space and desks and shelving already available, we were able to create a useful, vibrant space at no additional cost. It feels very much part of the mission of the space – to be innovative and creative and to look at materials in new ways – to have done that with the space itself. As we move forward with the maker space, we will continue to look for ways to integrate it into classroom learning. As teachers have spent more time in the space, they are imagining ways that they can use it with their classes. We plan to offer upper school electives in the maker space each term. We will be teaching computer assisted design to fifth and sixth grade students through the library program, allowing students to print their work on the 3D printer. We are planning to add new kits and equipment each year as well as offer professional development to staff.